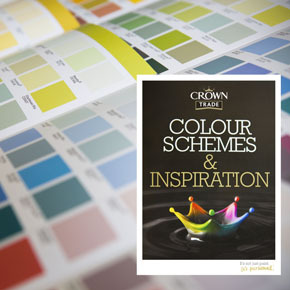 The booklet features 150 of the most popular colours in the Crown range, placed into colour families for easy reference and complete with a full description of each family’s characteristics. Each colour family is illustrated in different environments to provide further design ideas and inspiration for specifiers. Details on factors including light, space and colour psychology are also featured, in addition to guidance on Crown Trade’s colour mixing systems and the MyRoomPainter App. MyRoomPainter, available for free on the App Store and Google Play, enables specifiers to take pictures of an area to see exactly how a finished project will look in any chosen shade. Debbie Orr, Crown Paints Marketing Manager for Trade brands, said: “Colour Schemes and Inspiration’ pulls together a wide-range of guidance to help make the selection of shades easy and effective. We’ve used our knowledge and expertise, and considered the latest trends, to produce this guide, which ultimately helps specifiers get confident with colour. All shades featured in the ‘Colour Schemes and Inspiration’ guide are available in Crown Trade’s finishes, including Crown Trade Clean Extreme. Crown Trade Clean Extreme offers a ‘truly scrubbable finish’ on which marks and stains can be easily removed to ensure an attractive look is in place for the long term – ensuring a ‘just painted’ finish is maintained.